Looking for a four-ingredient fix for ground beef? 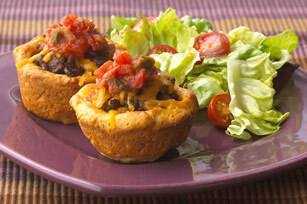 Traditional taco ingredients get baked inside biscuits in these Fun Taco Cups. Cook meat with seasoning mix as directed on package. Press biscuits onto bottoms and up sides of 10 muffin cups; fill with meat mixture. Bake 15 min. Sprinkle with cheese; bake 2 to 3 min. or until melted. Don't let the fun stop at the entree! Round out the meal with a fun salad bar. Fill a large bowl with crisp salad greens and smaller bowls with an assortment of chopped fresh vegetables. Then, let everyone help themselves to create their own salad. Substitute Cracker Barrel Shredded Tex Mex Cheese for the Cracker Barrel Shredded 4 Cheese Italiano Cheese. Serve with your favourite toppings, such as shredded lettuce, chopped fresh tomato, sour cream, guacamole and/or salsa.